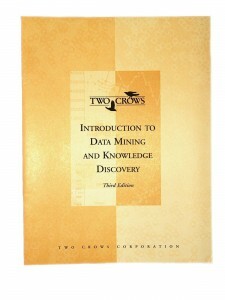 “Introduction to Data Mining and Knowledge Discovery, Third Edition” is a valuable educational tool for prospective users. It provides a clear, non-technical overview of the techniques and capabilities of data mining. Available as a PDF file, the contents have been bookmarked for your convenience. Tens of thousands of copies of “Introduction to Data Mining and Knowledge Discovery” have helped people in 100 countries worldwide learn more about data mining. (If your country is not on the list, please let us know and we will add it!) It’s also been used as a teaching tool at graduate schools of business including Stanford, M.I.T., and Harvard. We hope you’ll find it helpful too. File size is 227 KB. Required software: Adobe® Acrobat® Reader™ 3.01 or later, available as a free download.